Bilbao BBK Live recently revealed its second wave of artists set to perform this year. 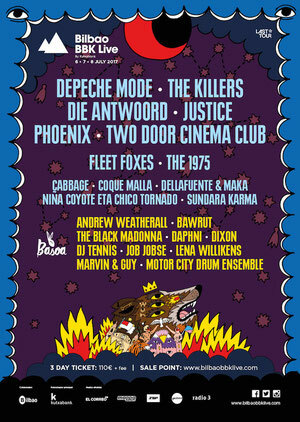 Justice, The 1975, Dixon, The Black Madonna, Sundara Karma, Job Jobse, MCDE and more will join previously announced acts including Depeche Mode, The Killers, Fleet Foxes, Phoenix, Andrew Weatherall, Daphni and DJ Tennis at the festival’s 12th edition, which takes place from 6-8 July 2017 atop the Kobetamendi Hill in the the heart of the Basque Country. Justice made a return to the scene in 2016 with the release of their first song in five years, ‘Safe And Sound’ and subsequent full-length, ‘Woman’. The enigmatic French duo who shot to fame in 2007 with debut, ‘†’, and hits like ‘D.A.N.C.E.’ aim to deliver an exhilarating, dance-fuelled performance. Next up, bringing a wealth of pop from their platinum-selling debut and 2016 follow up ‘I Like It When You Sleep’, ‘For You Are So Beautiful Yet So Unaware Of It’, is The 1975. The Kobetamendi Hill will play host to another live show from the British 4-piece. The line-up for Basoa, Bilbao BBK Live’s dance music space also grows, with a wealth of new additions, including Dixon, co-founder of the Innervisions label. The German producer’s sound and popularity has just seen him take the #1 spot in the Resident Advisor DJ Poll for the fourth year in a row. Also confirmed for Basoa is Chicago’s The Black Madonna, whose rise in recent years is apparent testament to her turntable and selector skills, Dutch DJ and former Trouw resident Job Jobse, Motor City Drum Ensemble, Bawrut and Lena Willikens. Completing the new additions are UK indie-rockers Sundara Karma, Manchester based five-piece Cabbage and a trio of Spanish talent, Coque Malla, Dellafuente & Maka and Niña Coyote eta Chico Tornado. With acts including Depeche Mode, The Killers, Phoenix, Two Door Cinema Club, Die Antwoord, Fleet Foxes, Andrew Weatherall, Daphni and DJ Tennis already confirmed and many more still to be announced, Bilbao BBK Live 2017 is possibly shaping up to be the biggest edition to date. Get more info at bilbaobbklive.com.